New ideas and new concepts are continuously being used to treat patients with all sorts of aches and pains. As patients we should continuously ask questions of our healthcare providers regarding new practices and treatment options. One treatment option that is becoming more and more popular is dry needling. 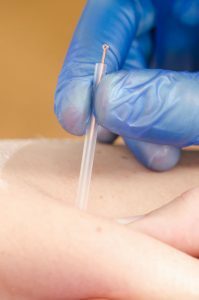 Dry Needling involves the insertion and manipulation of a thin filament needle to stimulate the healing process of soft tissues resulting in pain relief and restoration of healthy physiology. The areas targeted include muscle “trigger points” like the fascia, tendons and ligaments. Stimulation occurs when the inserted thin needle creates a twitch response deeper in the muscle that hands and fingers cannot reach. Dry needling is never a solitary treatment. It is used in conjunction with manual soft tissue work, stretches, exercises and even a modality of a pain-free electrical stimulation that all aid in eliciting this desired twitch response. The twitch response comes from the muscle fibers. A deep pain relief for acute and chronic symptoms across the body sounds great, but with the word “needle” in the name some are turned off. The process is actually very simple ñ and pain free. The needles are inserted into the tissues and muscles where the pain is being experienced. The feeling is described as the “slight poke of a toothpick – painless.” Almost instantly after insertion, you will feel gentle pressure ñ like a small, blunt object – until the needle is in place. Then, there may or may not be gentle electrical stimulation to the increase the pain relief. The unit is connected to the needles themselves and when the intensity of the stimulation is increased, the twitch or “flex” of the muscle occurs. The sensation continues to be pain-free. It is just the feeling of your muscles working without having to tell them to. Once the response occurs, the needle position may be adjusted to hit all the target spots for relief. After a few movements, the needles were removed and immediate relief is felt. Even after treatment is finished, and as the day goes on, you will feel continued loosening of the tissues. We recommend consulting a physical therapist to see if this treatment will be effective for you. For more information, contact us today.